The countdown to the 2019 Women's World Cup in France begins in earnest on Saturday when the host Bleues face the USA in Le Havre. French organizers are using the date to kick off a touring exposition on French women's soccer. "Il était une fois les Bleues" ("Once upon a time there was the Bleues") will trace the modern history of the women's national team, which dates back almost 50 years. But the reality is that the national team has only taken off in the last 20 years -- since the French men won the 1998 World Cup. Aime Jacquet, the coach of the 1998 World Cup team, used his influence to push for the French federation (FFF) to provide new resources for the women's national team and open Clairefontaine -- the national training center -- to women. Laura Georges' soccer career has spanned the rise of the Bleues, from when she was 12 and playing soccer in the park in Versailles with her friends to now as the French federation's 34-year-old general secretary serving as an ambassador to promote the Women's World Cup. A classmate told her about tryouts for a girls team at Paris St. Germain. Georges was fortune that Saint-Germain-en-Laye, where PSG is located, wasn't far from her home. Few clubs then provided opportunities for girls. By 2002, she had already played for France's senior national team when she was part of the second women's residency class that the French federation accepted at Clairefontaine, a class that also included Camille Abily, Sarah Bouhaddi, Elise Bussaglia and Elodie Thomis, who have also all gone on to have long international careers. American experience. Georges' big break came the next year when Boston College's women's team came to Paris for spring break and played Paris St. Germain. After the game, the BC staff asked her if she spoke English. "It was my dream to learn English and see the world," said Georges in an interview during the United Soccer Coaches Convention in Chicago. "I loved the human experience. The people I met. The classes I took. I learned a lot about sports psychology from [BC sports psychologist] George Mumford, who had worked with the Chicago Bulls." Georges, who played three seasons for the Eagles, returned to France just as women's pro soccer was getting started, first at Lyon and Montpellier, and later PSG, and played 188 times for France, going to the Women's World Cup in 2003, 2011 and 2015. As a player, Georges had the nickname "le Roc" ("the Rock") for her hard-nosed play as a center-back, and friends called her "Liliane" (after Lilian Thuram, her hero on the 1998 French World Cup team who hailed from the French island of Guadeloupe like her family did), but in 2017 she traded them in for "Madame la secrétaire générale" when she was picked by FFF president Noel Le Graet to be on his ticket for re-election in the No. 3 position as the general secretary. Women in power. Le Graet described Georges, who got her master's degree while she was playing in Lyon, as having the potential to be a great executive. But she is not the only woman in a role of influence in French soccer. Brigitte Henriques, the FFF vice president since 2011, was Le Graet's No. 2 on his slate of candidates. Florence Hardouin is the FFF's chief executive, and Nathalie Boy de la Tour was elected in 2016 as the French pro league's first female president. In many ways, France has been a trend-setter as a promoter of women's soccer. Lyon owner Jean-Michel Aulas has built its women's program into the biggest in Europe. OL has won 12 straight French women's league titles and the last three UEFA Women's Champions League trophies to give it five in the last eight years. Lyon's Ada Hegerberg, winner of the first Women's Ballon d'Or in 2018, earns the highest salary of any women's player in the world. Aulas' contributions to the growth of women's soccer explains the decision to award Lyon both Women's World Cup semifinals and the final at the 59,000-seat Groupama Stadium, opened in 2016 in the Lyon suburb of Décines-Charpieu. "We wanted to make sure the cities who are hosting the World Cup are really willing to do something for women's football," said Georges. "Lyon has done a lot for women's football, like Montpellier. We wanted to make sure they were recognized for their work, and Lyon is leading women's football in the world." Huge gap at the top. Still, the gap between Lyon and PSG at the top and the rest of women's first division clubs is immense. Some operate on budgets of less than $1 million a year. 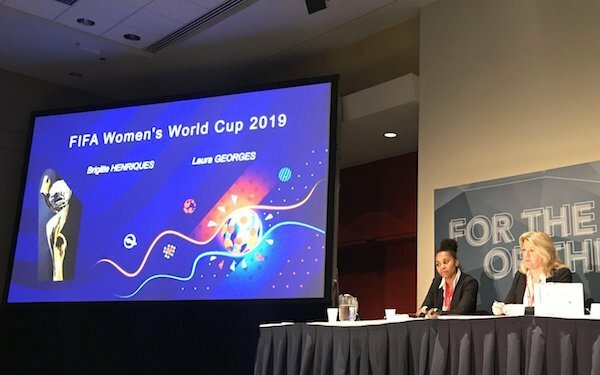 Georges wants one of the legacies of the Women's World Cup to be greater support from Ligue 1 clubs. "What we expect," she said, "is to have more professional teams, more men's professional teams, supporting the women's game. To make sure they're doing it not because we're asking them but because it is worth it and they are investing in women's football because they really want it and see the game is here." The FFF is doing its part to promote the development of women's soccer. The residential program in which Georges took part in 2002-03 in Clairefontaine has been expanded to eight regional "pôles espoirs" for young women. Like the centers for boys, players attend a local lycée and train five days a week, returning home on weekends. The goal is to prepare women for the life as a professional soccer player. "Their football is integrated in their school program," said Georges. "They don't have to train at 7 o'clock in the evening." The attendance goal is 1 million, which is ambitious considering that this is the first Women's World Cup that will not feature doubleheaders. Henriques, who also spoke at the coaches convention in Chicago, noted that Euro 2017 in the Netherlands drew huge crowds for the host Oranje, who won the tournament, but broadcasters complained about the sparse crowds at other games. Organizers are working with local governments to ensure that the stadiums are filled or close to capacity and promoting the tournament with the touring exposition, school contests and during the tournament with fan zones. If France is winning, that will do a lot to generate interest, like the French women's handball team did when it won the recent European championship before huge crowds and with extensive media coverage in France. For all the progress the French have made, though, the United States remains the reference point in terms of success on the field -- the USA enters Saturday's game with a 17-2-3 record all-time against France -- and support for women's soccer at the grassroots level, something that Georges saw first hand during her playing career at Boston College. "What I liked and wish I could bring in France," she said, "is the atmosphere and support of the game, and to have the support of the family, to be proud of having a daughter as a football player, and to have role models. In France, now it is starting. Players are role models, Eugenie Le Sommer and Wendie Renard. Before, Marinette Pichon was well known but not by little girls. When I came to the U.S., players were looking at me like I was a superstar. It was already in the culture."